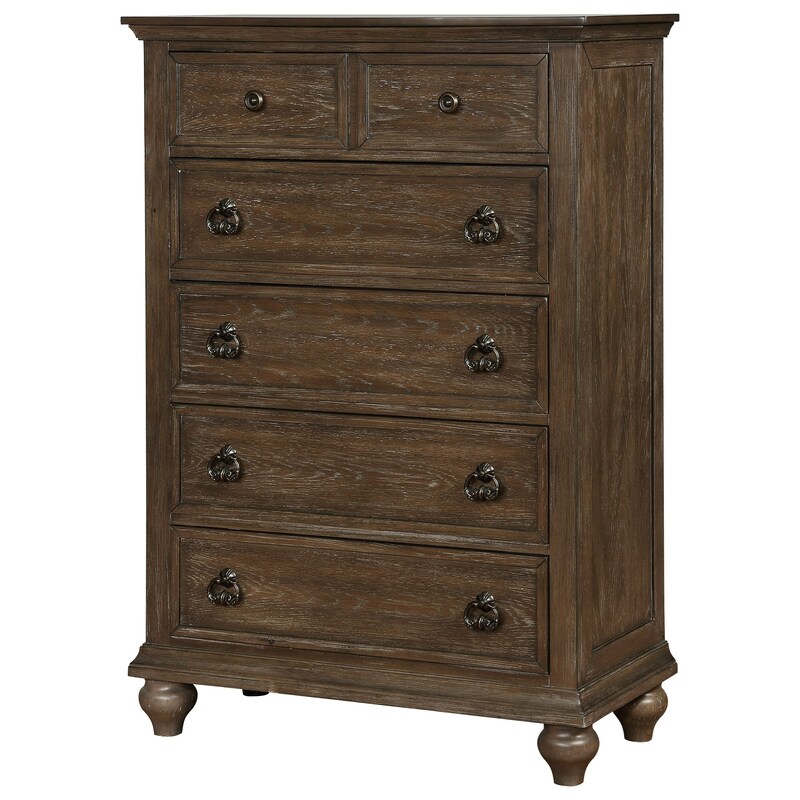 Enhance your home with the cottage style charm this chest emanates. With its rich, country-chic finish, bun feet, and detailed knob and ring pull hardware, this piece has the personality you want your decor to have. You'll appreciate the ample concealed storage space this chest provides too and how the drawer's durability and function is enhanced by its dovetail joinery and full extension ball bearing glides. The Tafton Cottage Style Chest with Bun Feet by Rooms Collection One at Rooms Furniture in the Houston, Sugar Land, Katy, Missouri City, Texas area. Product availability may vary. Contact us for the most current availability on this product. With this collection of bedroom furniture, it's easy to create a warm, cottage style haven where you can retreat to at the end of your day and start your morning off right again the next day. You're sure to appreciate the storage pieces' detailed metal hardware, bun feet, and rich wood finishes. You're sure to love the way the bed is the focal point of the room as well, featuring an upholstered headboard with button tufting and subtle diamond patterned accent stitching. With such cozy and intriguing designs, these pieces will create the perfect space that's all about expressing your personal tastes. The Tafton collection is a great option if you are looking for Cottage furniture in the Houston, Sugar Land, Katy, Missouri City, Texas area. Browse other items in the Tafton collection from Rooms Furniture in the Houston, Sugar Land, Katy, Missouri City, Texas area.